We mention furnaces because furnaces just work! They’re inexpensive, can be easy to install, and they use natural gas—a cheap fuel source. We say “can be” easy to install because the work of installing a gas line can be costly. If you already have gas lines, however, then it makes furnaces a much quicker installation. Furnaces are considered forced-air heating systems. They work by heating air and then blowing that air into your home through a duct system. It’s a fast, effective system that has been used by the majority of the country for decades. Heat pumps are also forced-air heating systems, but they don’t operate quite the same way. But this is a good thing, because heat pumps use energy more efficiently than gas furnaces. In the simplest terms: a heat pump is like an air conditioner in reverse. It essentially uses heat transference to move heat from one place to another. In fact, heat pumps can function as both air conditioners and heaters. Their versatility and efficiency make them popular choices in new homes, but they do come with an expensive installation cost. These heat pumps use the same principles as other heat pumps, but with one key difference: they take their warmth from under the ground instead of from the air. This works very well because the temperature underground tends to stay the same all year-round, despite weather conditions. Geothermal heat pumps require that a long set of metal loops be buried beneath the ground. This can make for an expensive installation, but it’s going to be worth it: those loops will last nearly 50 years. This is a system you’ll want to have in mind when you’ve found the house you plan to live in for the rest of your life. The heaters we just mentioned above are all forced-air heating systems. Boilers, on the other hand, come from the family of radiant heating systems. 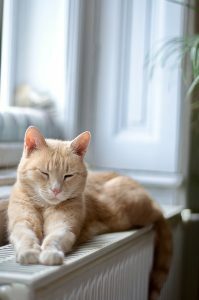 Radiant heating works by warming the objects around the heat source, as opposed to blowing hot air on them. This method of heating is often said to feel more comfortable and natural. Boilers are not easy to install, however. They require a system of pipes be placed behind the walls or under your floors. They also must be connected to an electric or gas water heater. Yet, the longevity of these systems makes it worth it. Boilers have fewer moving parts and generally require less repairs. If it’s time to find a new heater, we can get you set up. Contact Westland Heating & Air Conditioning today!